We are a leading Manufacturer of gas safe india safety device, diamond gas safety device and gas safety device from Navi Mumbai, India. We offer Lpg Gas Safety Device ,Gas safe India safety Divese Has 3 Years Pice To Pice Replacement Warranty With 15 Cror Insurance. 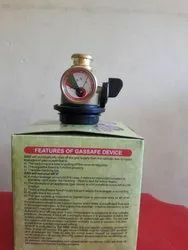 We offer Diamond Gas Safety Device. Has 3 Years Pice To Pice Replacement Warranty With 20 Cror Insurance . Natural Gas is one of the most commonly used fuels at domestic as well as industrial levels to provide thermal energy for carrying out a wide array of processes. But proper safety measures and appropriate handling is quite important while dealing with it, as there is no dearth of instances where considerable damage to life and property due to accidents resulting from leakage has occurred. Sohum Autogas Systems Pvt. Ltd. brings you a widely acclaimed range of the best quality industrial Gas Safety Device, that is highly sought after for their exceptional material attributes and functional life. Our selection of Gas Safety Device which includes Cylinder Safety Device, Domestic Gas Safety Device, Appliances Gas Safety Device, LPG Gas Safety Device, Industrial Gas Safety Device, Commercial Gas Safety Device, Durable Gas Safety Device, etc. are quite adept at containing the possibilities of safety hazards, thanks to their exceptional build quality, perfect design and material endurance. Our products have been designed in accordance with industrial safety norms and internationally acceptable parameters of build and working mechanisms. Not only that, but we also follow the guidelines specified by leading standardization authorities and the products are quality checked multiple times to make sure they are reliable and worth every single penny. 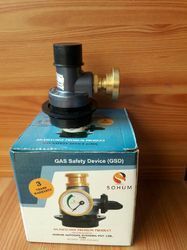 SOHUM Gas Safety Device is very efficient and durable as they can be easily fitted into gas conduit. These are manufactured using the high-end diaphragm in conjunction with a durable valve to make the passage for the gas leak. These are used for stopping the danger that is caused by a barrier which starts from the gas supply and ends at the gas faucet. Our Gas Safety Device forecloses the flow of gas to the following apparatus, hence avoiding the damage. The benefits of our devices are that they regulate the gas flow along with its supply, ensuring optimized consumption as well as safety. With our valves, it is possible to overcome the associated challenges such as the fast opening of the valve, the longer time is taken to reopen the valve and others. If this valve is installed, then the benefit achieved is its automatic closing whenever interruption is faced in the gas supply. Another advantage is easy to clean option in the path of a valve.